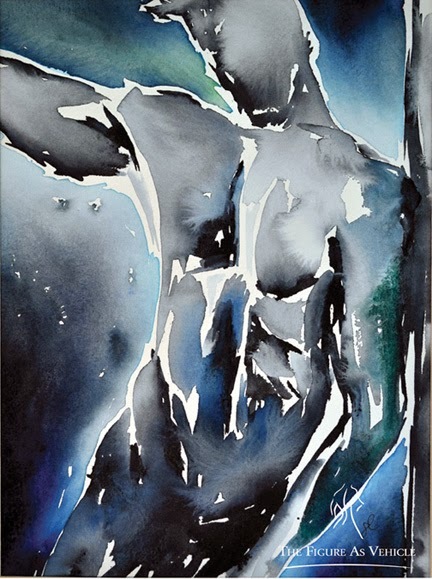 JANUARY 12, 2014 - ORLANDO, FL - Orlando artists John Carollo and Marsha De Broske will present their collaborative show of figurative artwork at the Butterfield Garage Art Gallery in St. Augustine, FL. 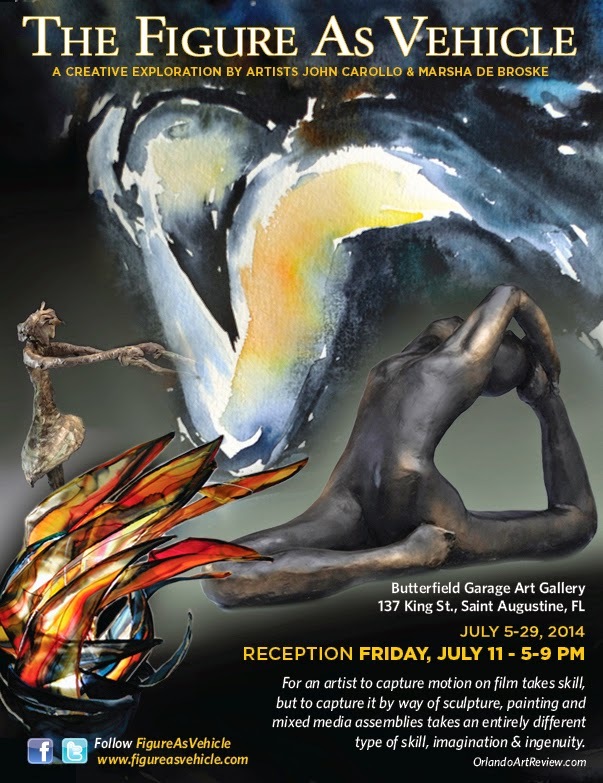 The exhibition will run from July 5-29, 2014 and feature an opening reception on Friday, July 11, from 5-9 pm. 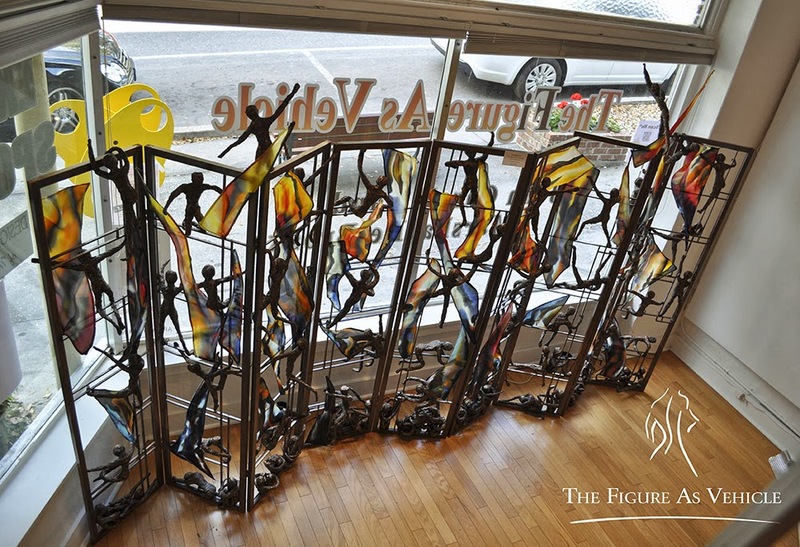 Our figures move beyond form to become vehicles for conveying messages to the viewer. They can be a voyage between worlds or time - gestural and stately, relaxed or straining with tension. Though we work in different mediums, a binding through line we share is the invitation each of our pieces offers the viewer to find a personal connection and interpretation with our work. Visitors are invited to contemplate various moods as they enjoy artwork displayed on the walls, windows and even ceiling. captivated thousands of visitors in two states, The Figure As Vehicle continues to evolve, grow and adapt to each new venue. Both artists will premiere works specifically created for the Butterfield Garage space. 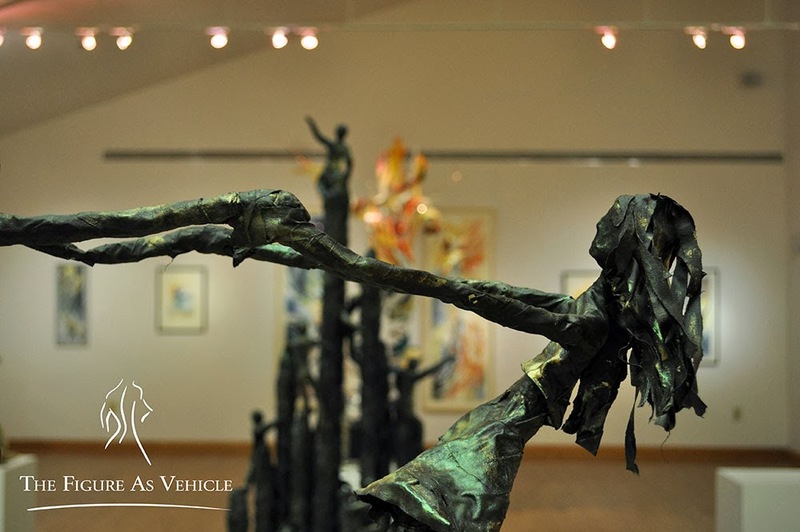 Marsha De Broske is an accomplished sculptor working primarily in bronze, whose work has been recognized and selected for display in numerous galleries and public art venues, such as the Museum of Florida Art, the Kissimmee Sculpture Experience, Epcot, Boynton Beach and the Grand Bohemian Gallery. 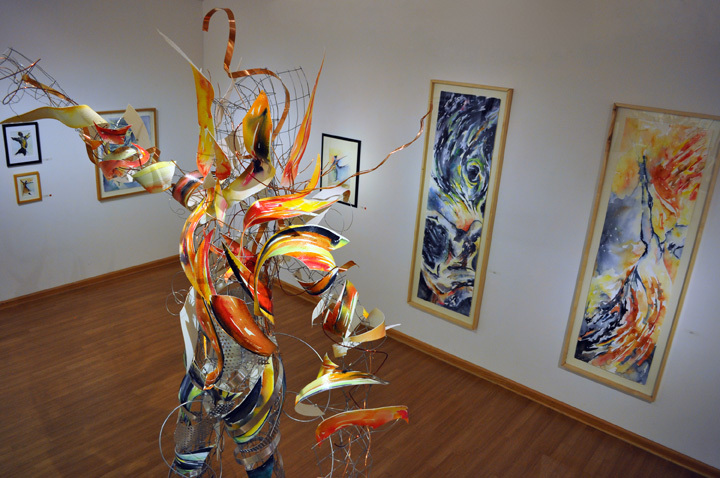 She received United Arts of Central Florida grants in 2007 and 2004 and has work in the permanent collection of the Crealde Sculpture Garden in Winter Park. Learn more about Marsha at www.MarshaDeBroske.com. 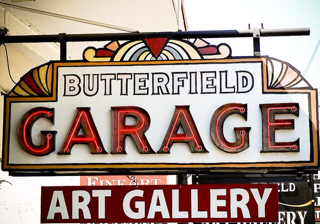 Open since February 1999, Butterfield Garage Art Gallery is the brainchild of artist Jan Miller. Her vision was to create an artist-run gallery for professional artists that would encourage creative experimentation. Jan and Max Miller purchased the 1927 building whose first use was as a parking garage and “showplace” for cars. On the second floor they discovered the original neon sign which appealed to Jan and it became the gallery’s name. 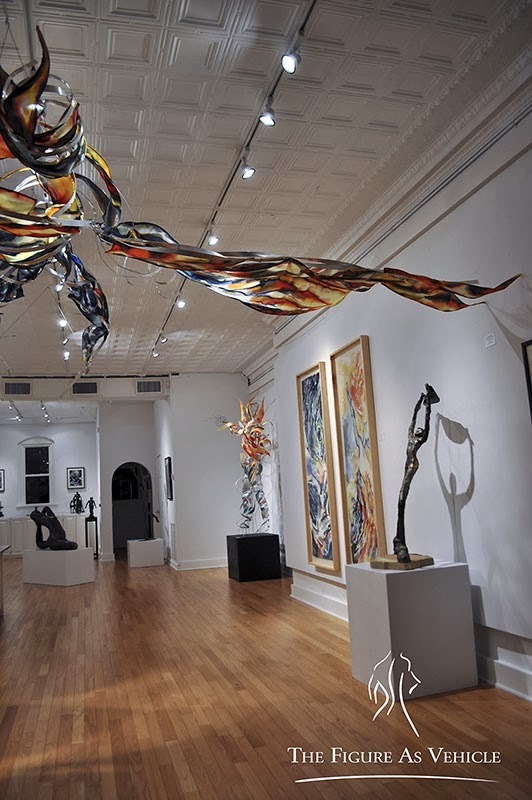 With a reputation for showcasing the areas most distinguished professional artists, it remains one of the galleries in the Saint Augustine area where the public can interact with the artists. The Butterfield Garage Art Gallery mission is to be a leader in the presentation of traditional and contemporary visual arts in North East Florida, and to encourage the experience of direct accessibility and dialogue between artists and their customers. Gallery hours: Daily 11 am - 5 pm. 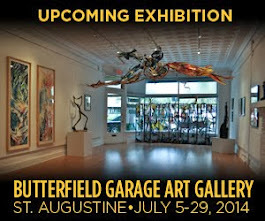 Visit www.butterfieldgarage.com or call 904-825-4577 for more information. Also, check out their Facebook page.